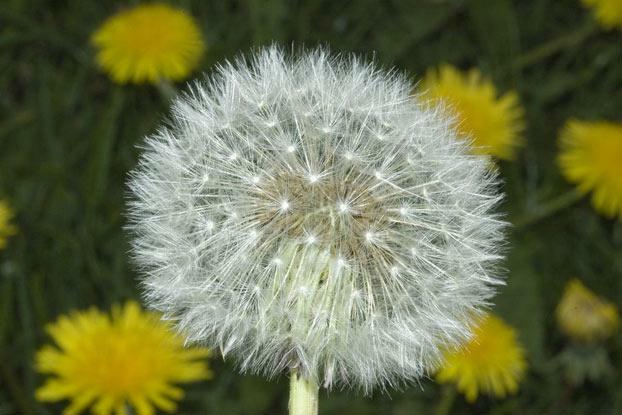 Dandelions are well-known, robust weeds; vernacular names for the dandelion include 'wet-the-bed' and 'pissy-beds', which refer to the belief that just touching part of a dandelion can cause bed-wetting. 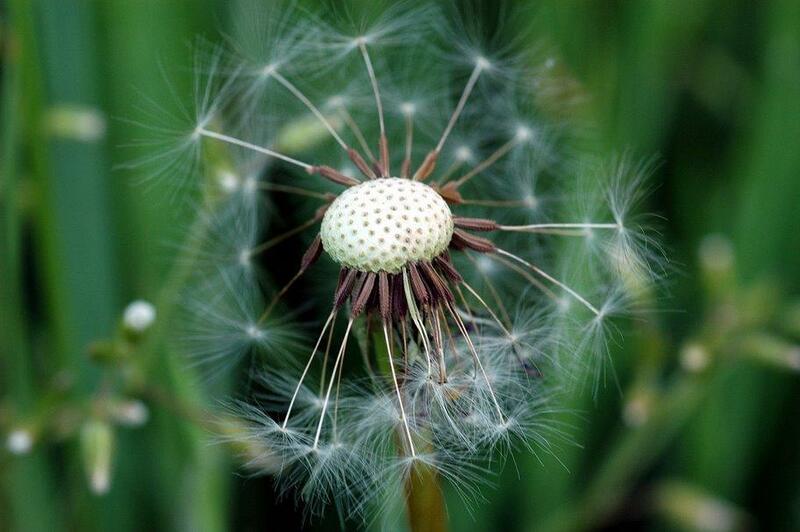 Dandelion fruiting heads are familiar to children as dandelion clocks, which are used to 'tell the time' by the number of blows taken to remove the fruits (for this reason dandelions are often known as 'blowballs' in the USA). Commonly known as dandelion, Taraxacum officinale has many culinary and medicinal uses, despite being generally regarded as a weed. Taraxacum officinale is native to Eurasia. 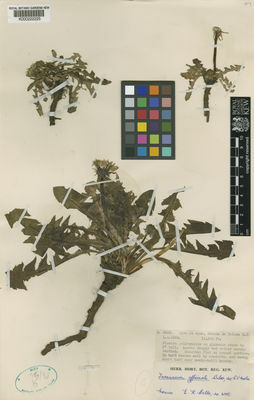 The genus Taraxacum has a wide, cosmopolitan distribution, with species found as far afield as Mexico and South America. The common name derives from the French ' dent de lion ', meaning 'lion's tooth', which refers to the deeply toothed, deep green leaves, which are in rosettes. The bright yellow flower heads are borne on hollow stalks and the fruiting heads have a distinctive downy appearance. 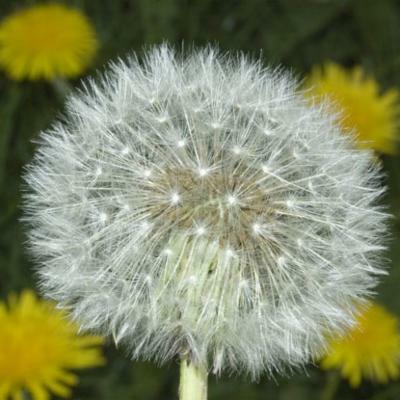 As most British dandelions produce fruit without being fertilised (they are apomictic), substantial problems arise with the taxonomy of these plants. This group is a complex consisting of around 200 microspecies, and is typically treated as a species aggregate, denoted as Taraxacum officinale agg. In reality, the specimen that was used to describe the species first of all has turned out to be a microspecies restricted to Lapland, and it is not the same as the plants seen in grassland, lawns and along path edges in Britain. Trying to identify the microspecies has turned into a science of its own, with the experts termed 'taraxacologists'! The dandelion is a perennial plant, and flowers throughout the year. 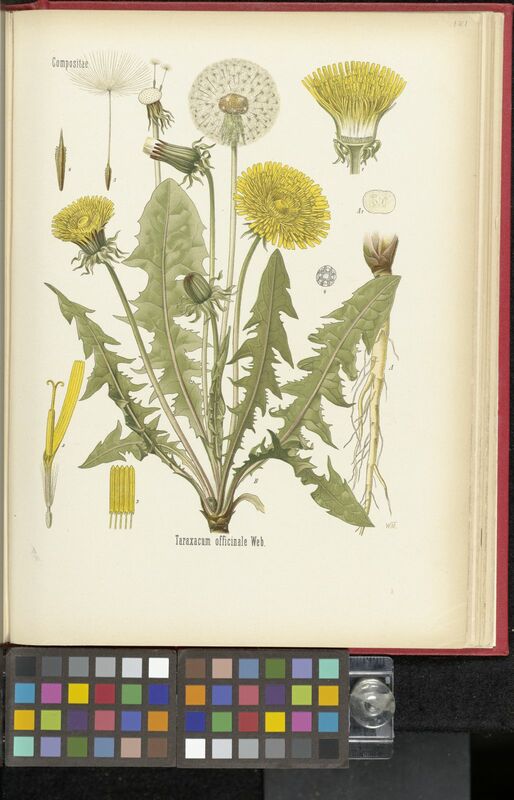 Dandelions have deep taproots, and the whole plant contains a milky fluid known as latex. The flowerheads close at night, and can produce around 2,000 wind-dispersed fruits. Plants can also regenerate from pieces of the taproot. 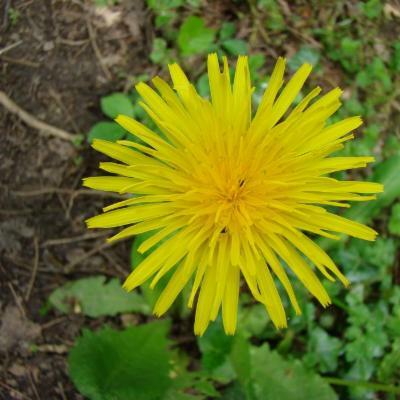 Although generally regarded as a weed, dandelions have many uses, both culinary and medicinal. 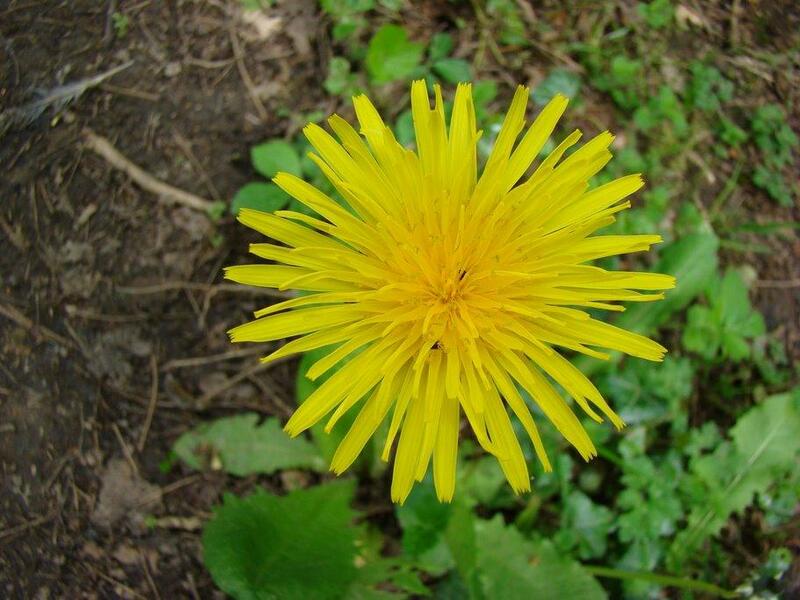 Taraxacum officinale has diuretic and laxative properties. It has been used as a tonic, to treat rheumatic problems, and as a blood purifier. Young leaves and inflorescences are used as ingredients in salads and stir-fries. Blanched hearts (obtained by earthing up or tying the leaves together) are also eaten. The flowerheads are used to make dandelion wine, while the bitter root can be dried to make a substitute for coffee, a practice that was common during the rationing of the Second World War. 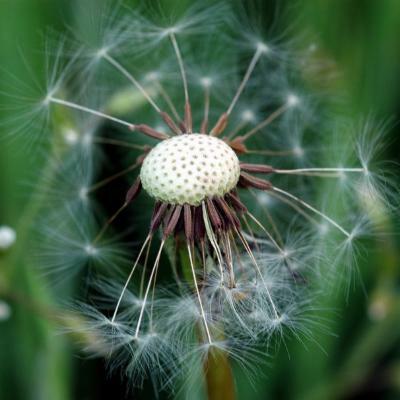 Taking the fruits from dandelion clocks can provide hundreds of plants if they are sown onto an all-purpose compost in deep pots, to accommodate the roots, or straight onto open soil. Plants are likely to start flowering in their second year. There are seed suppliers who stock a thick-leaved variety, more suitable for growing as a salad vegetable. The dandelion is so successful at colonising abandoned areas of the garden that no help is really needed to grow it. The plentiful one-seeded fruits are carried on the wind and can travel relatively long distances so neglecting a garden will usually ensure that this plant appears. Removing it is more difficult, as the long, thick taproots will delve down deeply into a border or lawn and even in cracks in paving, making them hard to remove completely. Chopping off the top of the plant is not enough to kill it as it will sprout again from the remaining roots. Rabbits love the leaves so if you have one as a pet it may appreciate a patch of dandelions being allowed to grow in a corner of the garden. The flowers and fruiting heads are attractive but this plant can soon take over and, because it is so strongly associated with a poorly kept garden, deliberate cultivation is rare. Found in a very wide variety of habitats, but tends to thrive in disturbed sites such as lawns, paths, waste ground, pastures and road verges. Some species are found in natural or semi-natural habitats, including fens, sand dunes and chalk grassland. Leontodon taraxacum var. vulgare Benth. Mabberley, D. J. (2008). Mabberley’s Plant-book. A Portable Dictionary of Plants, their Classification and Uses. 3rd Ed. Cambridge University Press, Cambridge. Press, B. & Gibbons, B (1993). Photographic Field Guide to Wild Flowers of Britain and Europe. New Holland Publishers (UK) Ltd, London. Clapham, A. R., Tutin, T. G. & Moore, D. M. (1987). Flora of the British Isles. 3rd Edition. Cambridge University Press, Cambridge. New Zealand Institute for Crop and Food Research Ltd. Taraxacum officinale. (Feb 2003).